The Friction Series is our Spring Roped Climbing comp held at each of our locations with an Onsight Final to conclude the events. This is a community comp, fun for all abilities! We’ll provide food and snacks, refreshments & beer (for after climbing of course), and amazing routes! See you this Friday at the first in the series at PG Belmont! COMP SCHEDULE – all comps start at 5pm. Youth: all youth 15 years and under. The top 3 scores of the entire comp will be invited to pariticpate in our Onsight Series Final at PG Sunnyvale! 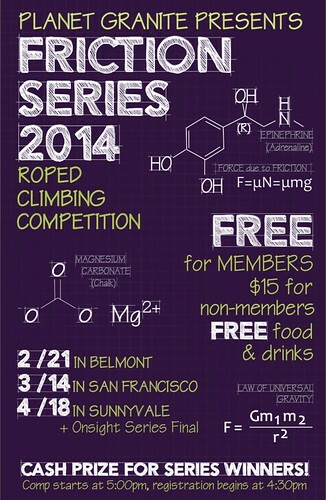 To be eligible to compete in the finals, competitors must also compete in the Sunnyvale Comp at 5pm. This is not based cumulative scoring, so if your score at PG Belmont beats out the top scores from PG Sunnyvale and PG San Francisco, you’ll be invited! In the event a tiebreaker is needed, cumulative series scores will be considered. Witness the best climbers duke it out high above on ropes in an action packed, breath holding event! 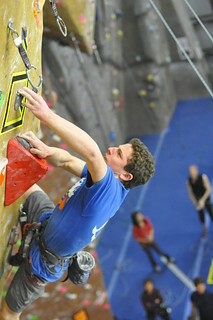 Even better – the routes will be left up after the comp so you can test your skills against the best. First Place – $150 cash! Mike putting on an amazing show as the clock ticks down to the final moments of the comp! RAFFLE FOR PRIZES PLUS FOOD AND BEER! A raffle will be held to auction off amazing gear by our awesome sponsors. We’ll have some yummy grub, great beer and of course Tshirts! There’s no other place to be on Friday night! Special thanks to our series sponsors!